Location! Location! Location! 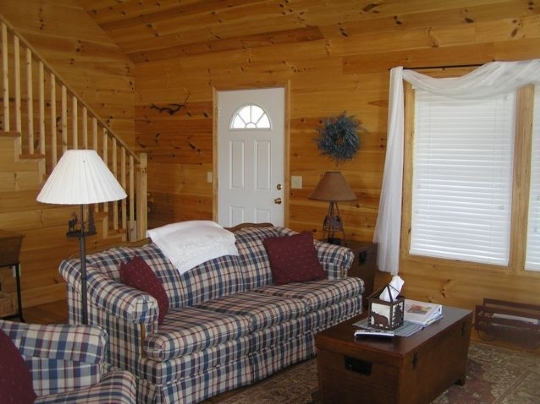 This beautiful Blue Ridge log cabin is conveniently located 15-20 minutes from Boone and West Jefferson. Bed Arrangements: 1 King,1Queen, 1Full 3 Twin, 1futon.,1sleeper sofa,1single. 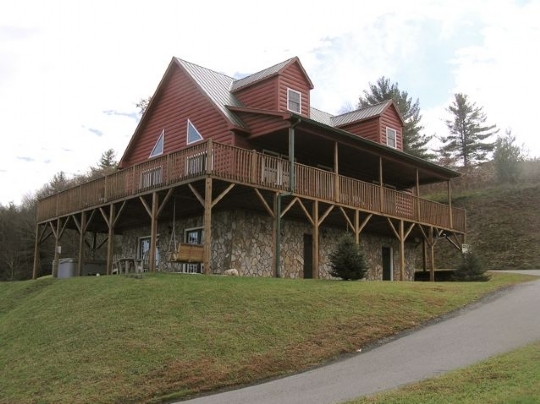 Enjoy amazing views of the North Carolina Mountains and the scenic New River from the great wrap-around deck of this home. Just 5 minutes from the cabin, you’ll find the historic Todd General Store where you can stop in for an ice cream or sandwich while you’re shopping for that special gift. At the store, you can also enjoy mountain storytelling or live bluegrass. Also in Todd is the Rivergirl Fishing Company where Kelly will teach you how to fly-fish in the New River, the second oldest river in the world. Kayak and bike rentals are also available at Rivergirl for a scenic float or ride along the river. 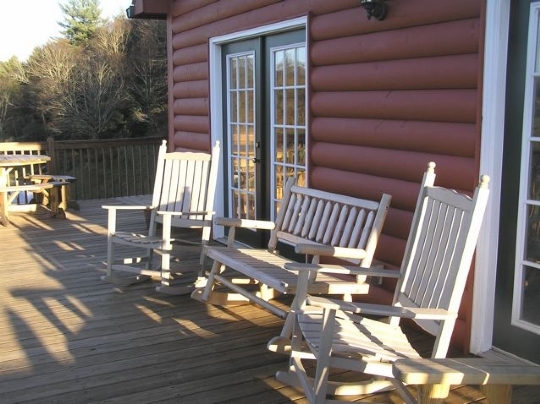 At the cabin, you’ll enjoy rocking your cares away on the deck while taking in the vista of acres of Christmas trees across the river. 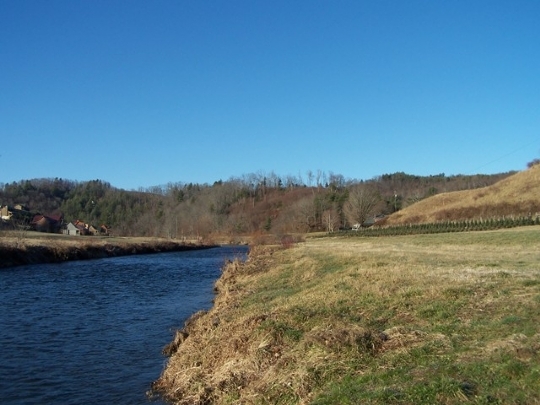 Don’t forget your bathing suit; you’re only a short walk from the access area on the New River. Take a nice gentle bike ride on Railroad Grade Road with his and her bikes. Once inside the cabin, you will find it is packed with amenities. 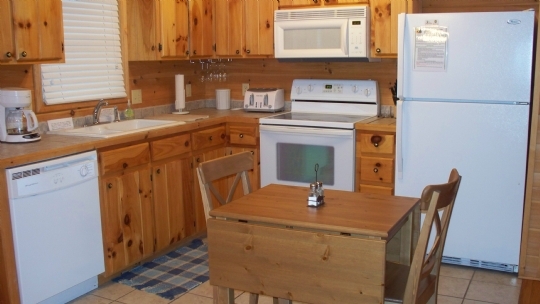 The kitchen is well-equipped with everything needed to prepare a gourmet meal. After dinner, simply put the dishes in the dishwasher for easy cleanup. There is also a gas grill available for those who would rather do their cooking outdoors. 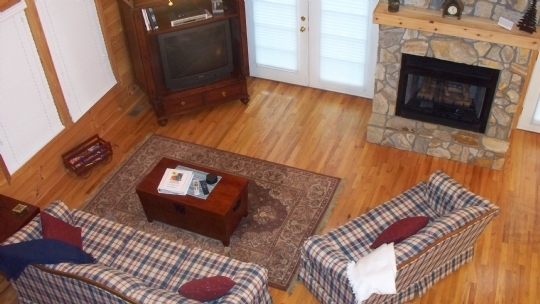 In the living room, you’ll find a beautiful gas fireplace to take the chill off the cool mountain evenings. 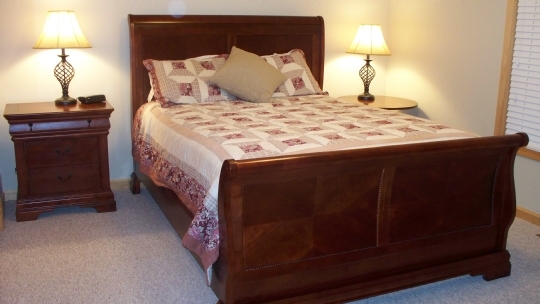 Comfortable seating includes a queen size sleeper sofa. 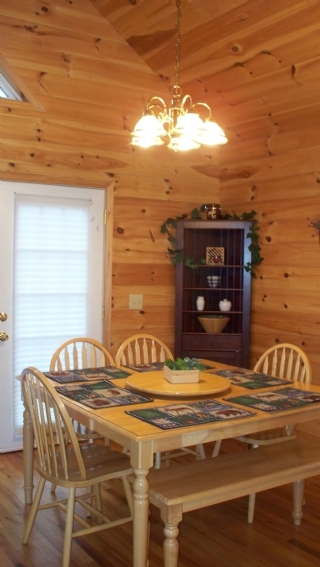 The cabin is equipped with wireless Internet as well as Satellite HDTV and DVD available in the both the living room, the downstairs game room and master bedroom. 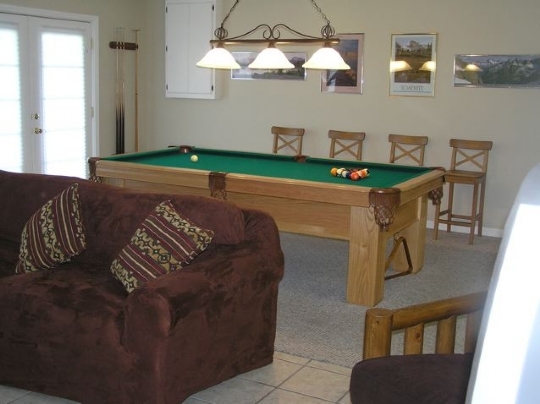 Speaking of the game room, you’ll have hours of fun with the pool table, X-Box and poker warmed by another gas fireplace. 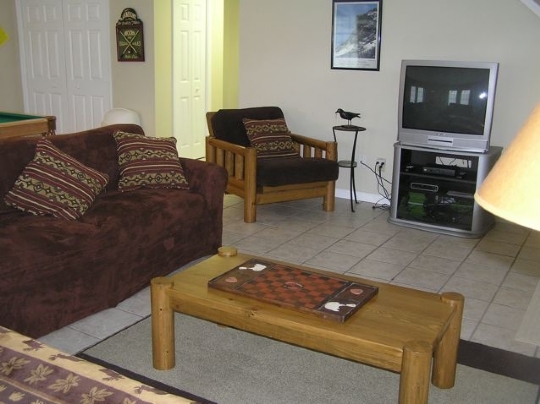 Around the checkerboard, you’ll find a comfortable sofa, full-size futon and single futon. 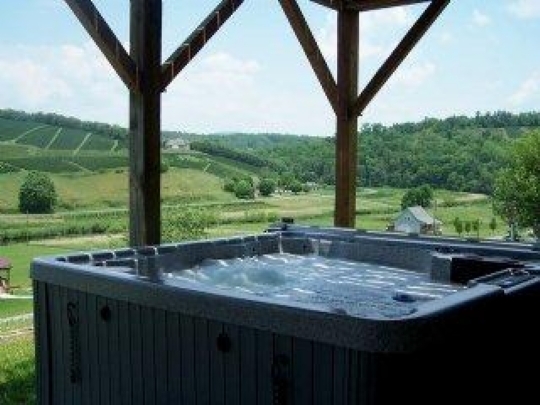 Just outside the door, is the hot tub and patio set. 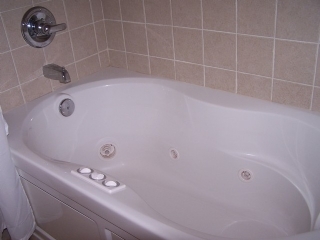 The 4 private bedrooms include the spacious master suite with king size bed and full private bath with Jacuzzi tub. 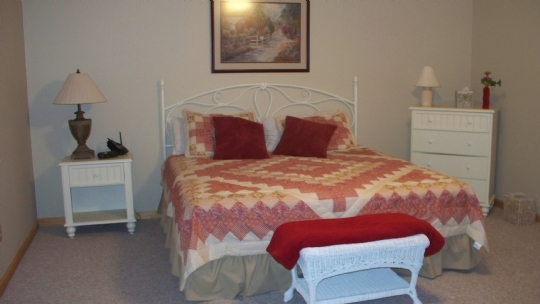 The second bedroom is located on the main level with a queen bedroom set. The third bedroom is also on the main level with a set of bunks(twin) and 1 additional twin bed and a flatscreen TV with DVD/VHS player for the kids. New 4th small bedroom on lower level with full size bed. For your convenience, the owner has provided river bikes and kayaks to use at your own risk and bring your own life jacket and bike helmet. 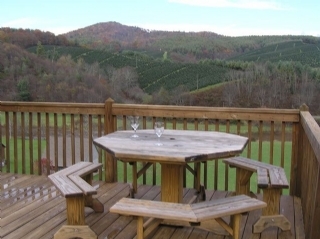 This lovely mountain home provides sleeping for 11! If you’re ready to relax and escape the hustle and bustle, this is the place for you. Start making memories and visit a Sweet Spot. Our weekly rate reflects 7th night FREE! Our monthly rate reflects 28 days! Easy Check-in on all cabins!